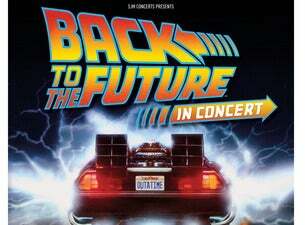 Prepare to experience the classic Hollywood blockbuster Back to the Future like never before when the Czech National Symphony Orchestra brings Alan Silvestri’s iconic score to life, in sync with the movie in venues across the UK in April 2019. First released in 1985, the science-fiction adventure follows Marty McFly (Michael J. Fox) as he suddenly finds himself transported to 1955 via a time machine made out of a DeLorean. Whilst back in time, Marty must not alter his own future by making sure his parents fall for each other plus rescue his eccentric friend Doc Brown (Christopher Lloyd) from terrorists and get back to the future, all whilst avoiding the unwanted attention of local bully Biff (Thomas F. Wilson). The film was a wild success and spawned two sequels. Its popularity has endured throughout the years and made a dramatic impact on pop culture. Audiences are in for an exclusive treat at these shows. The original award-winning composer Alan Silvestri has added 20 minutes of brand new music to the film’s score, especially for these performances.